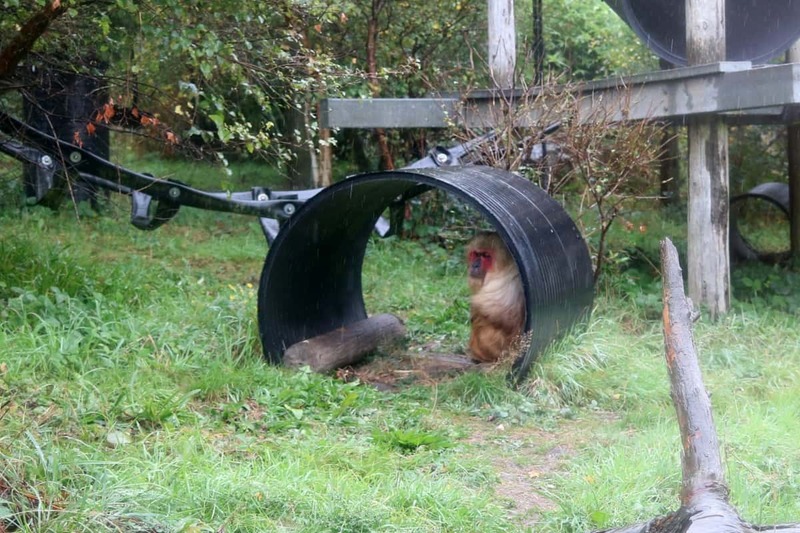 When we stayed in a yurt in Dorset a few months ago we took the opportunity to visit Monkey World – somewhere we have wanted to visit for years. 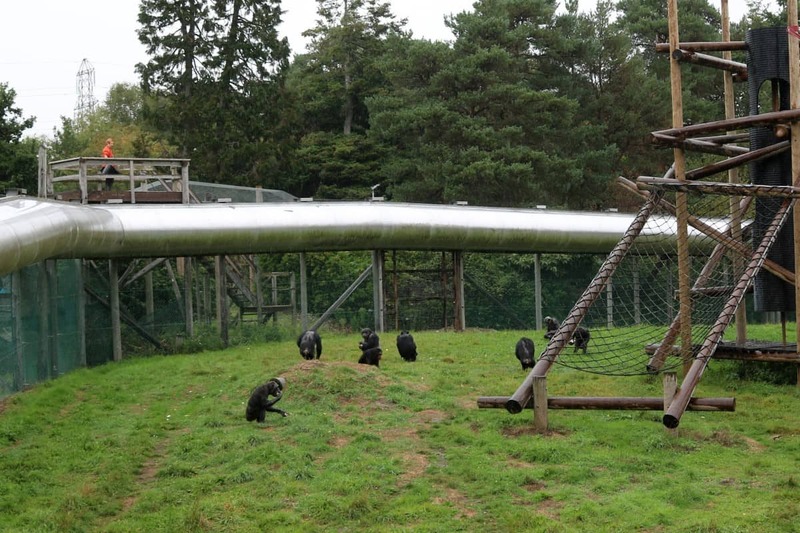 Monkey World in Dorset is home to over 250 monkeys from 20 different species. 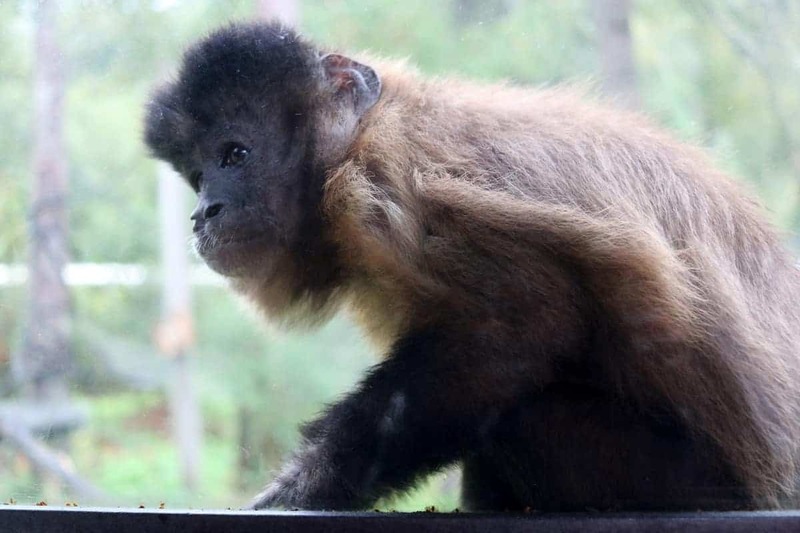 It was setup in 1987 and was intended as a home for abused chimpanzees from Spanish beaches but is now home to many more primates from all over the world. 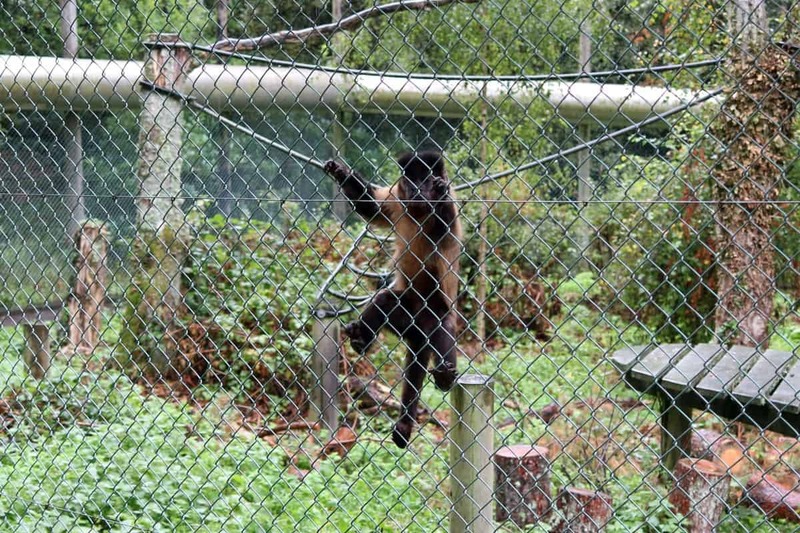 Spanning over 65 acres of land, Monkey World is unique in the fact that it works with foreign governments all over the world to stop the smuggling of primates from the wild. 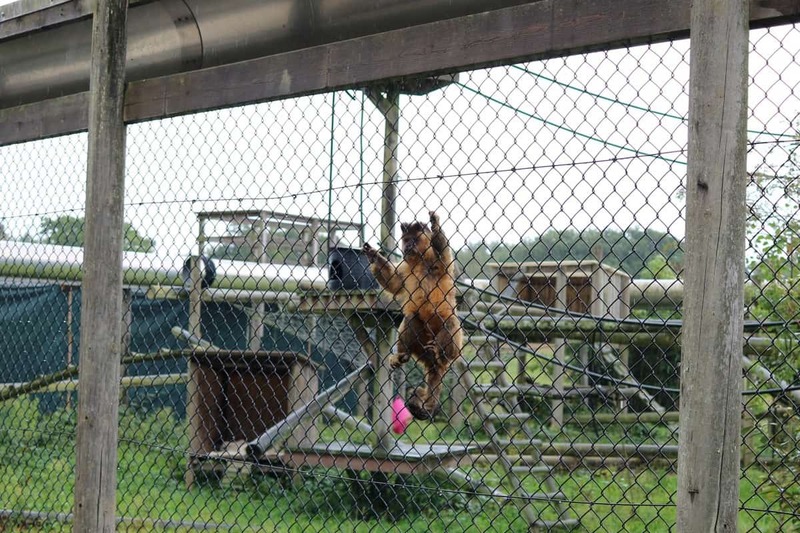 Monkey World call their animals ‘refugees’ and not only takes in smuggled monkeys, it also looks after those that suffered abuse or neglect such as tested on in laboratories or kept cooped up in small cages in private homes. As soon as you enter through the turnstyles, there are toilets, a gift shop and café along with the first monkey enclosure. 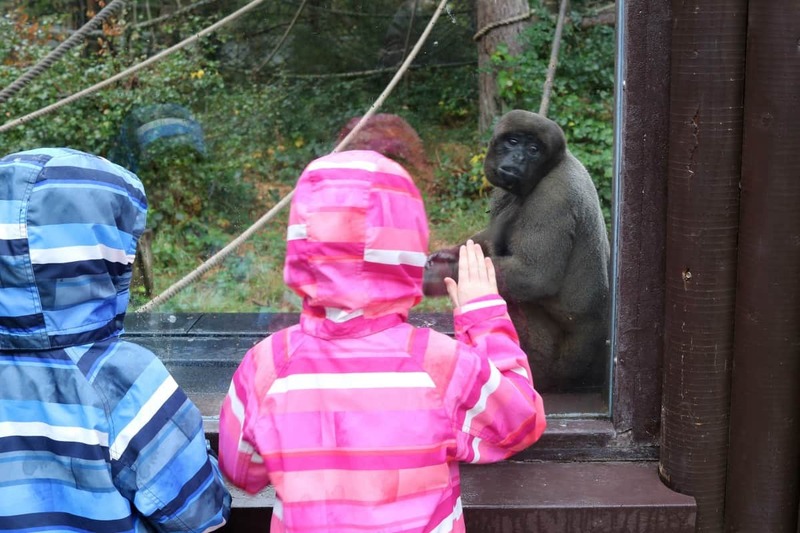 Although it was raining heavily when we visited and we were quite early, the Gibbons inside were having a great time, showing off through the windows and happy for the children to approach the glass and get quite close. As we made our way around the park, we didn’t have trouble at all getting sight of many of the monkeys in their habitats. 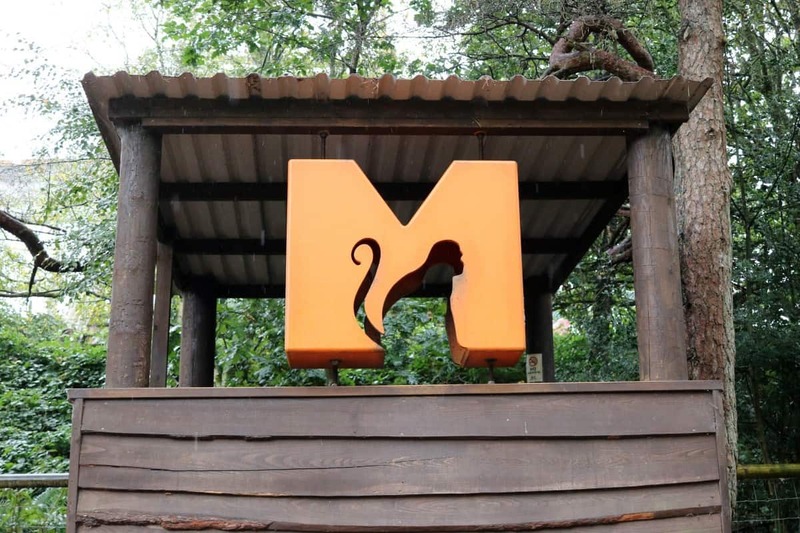 There is a natural flow to the park and with the many sign posts and map that we picked up at the way in, we knew exactly where we were and where we wanted to go, making sure that we didn‘t miss out on any of the magnificent monkeys along the way. 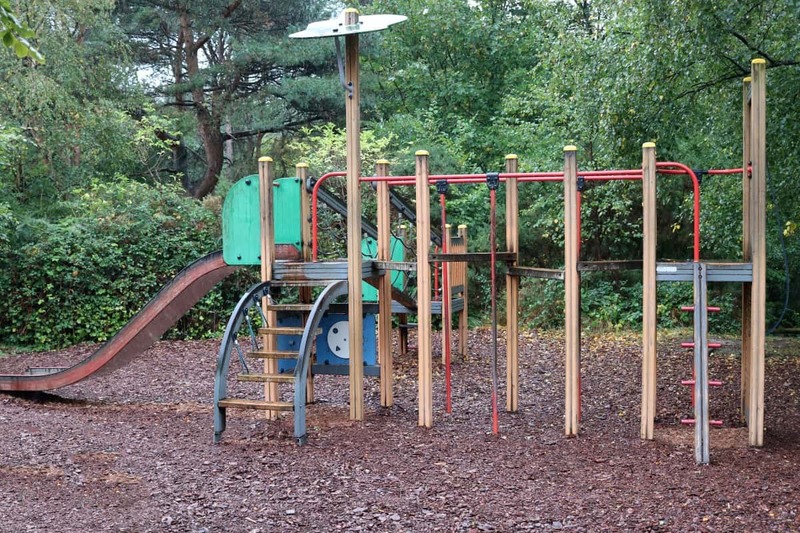 The habitats have been designed with the occupants in mind with trees, bushes and climbing equipment. 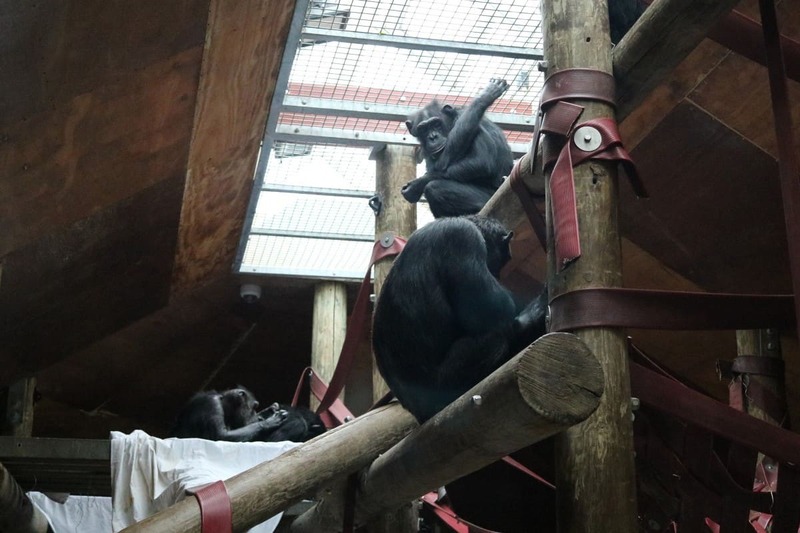 The large chimpanzee area was great with a raised, sheltered viewing platform with large windows downstairs to see inside the chimps’ sleeping quarters. We were lucky enough to see breakfast time and it was fantastic to see chimps being chimps! 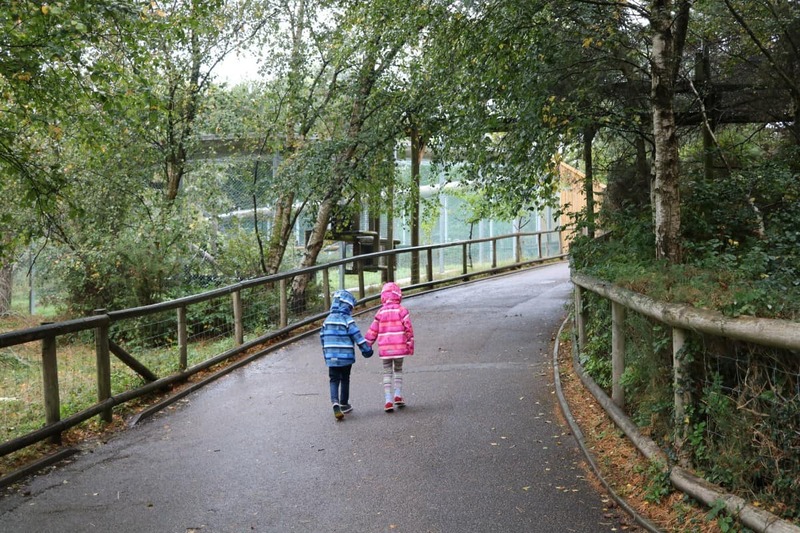 The Orangutan enclosure was close by and due to the weather, they were all inside and on good form. 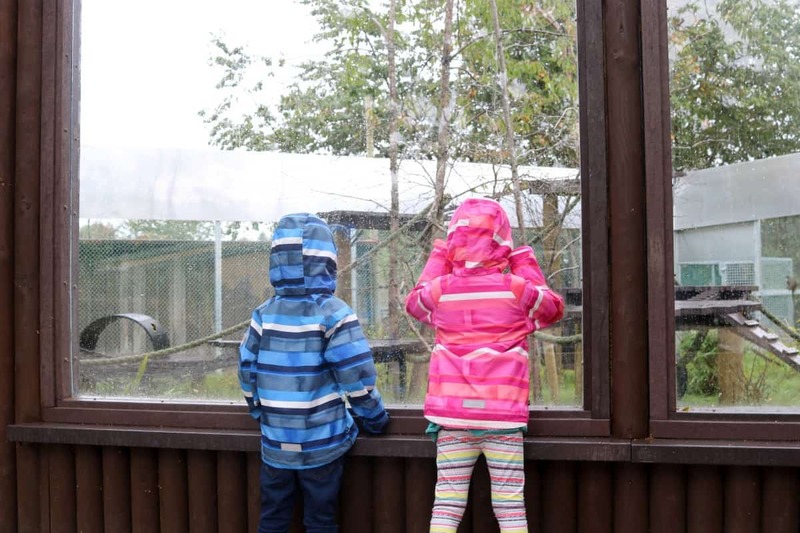 There is also an Orangutan nursery at Monkey World, and when we found it in the middle of the park, the children fell in love with the handful of young Orangutans that were being well looked after and cared for. Near to the nursery is an awesome lookout tower that lets you see across much of the park and into the nearby large enclosures if the inhabitants aren’t easily visible from ground level. The centre of the park also offers another café with open air seating that is covered and had electric heaters in the ceiling, a very welcome sight on our wet and cold day out! After a quick snack stop, we carried on around the ‘Woodland Walk’ towards more Gibbons and smaller Capuchin monkeys. 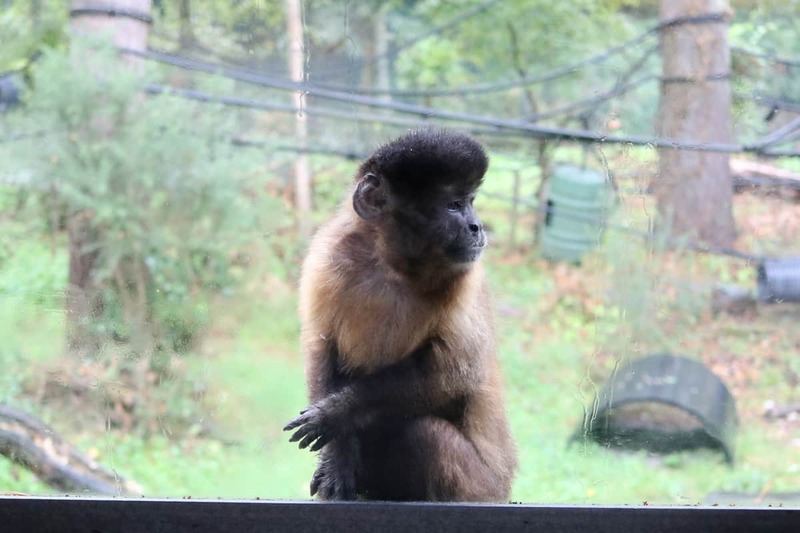 Sadly, many of the Capuchins had come from labs and small cages before finding a home at Monkey World and their behaviour has been affected, with constant ‘looping’ around a small area even though they now have a large area to see out their days. 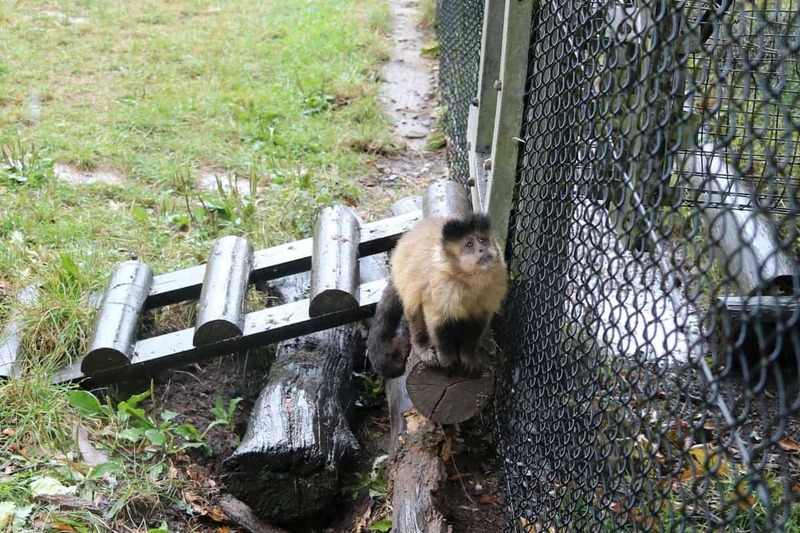 It is obvious from the passion of the staff and the fact sheets by the enclosures that every single Monkey is now as free as they can be and has the best care on offer. Before we left Monkey World, we stopped for a light lunch in the main café which was reasonably priced, clean and with good service. We then took a stroll through the gift shop, picking up the standard magnet souvenir for our board at home. 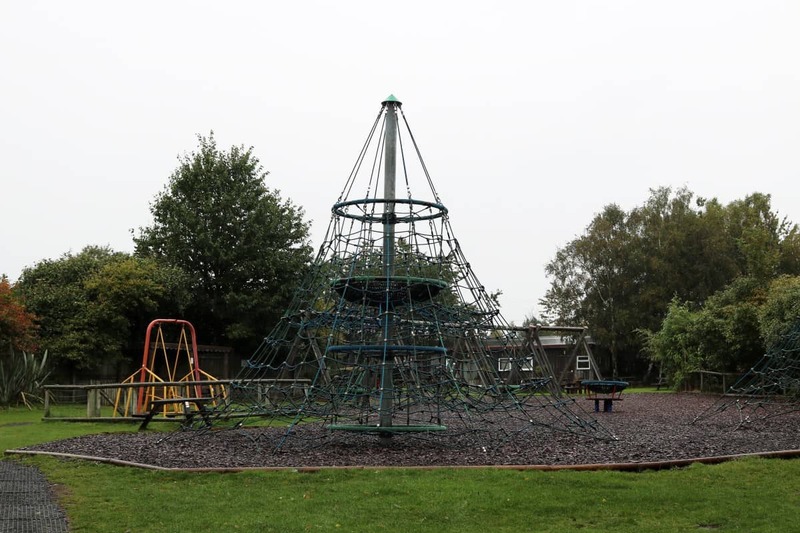 If the weather had been nicer the children would have been able to make more of the facilities on offer at Monkey World like multiple play parks and areas to explore. We’ll have to save that for another time. Monkey World was a really lovely day out. It was educational and our ticket price went towards helping save and rehabilitate more monkeys in the future. 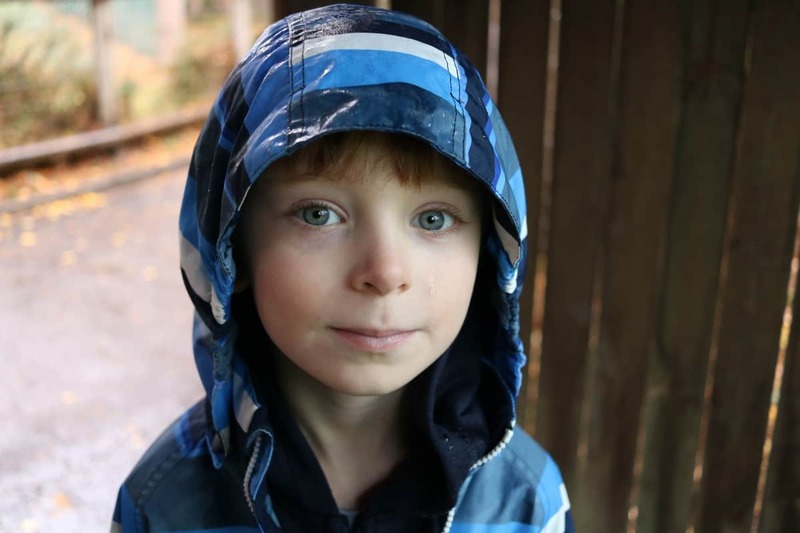 If you’re looking for a day out that gives a little back too then Monkey World is one to visit.